Christian families want Christmas to be more spiritual, less commercial—more about Jesus and less about Santa. We also want to connect Christmas with the Bible. Sure, we read the “Christmas story” from the book of Luke, but there’s so much more to the story. For Christians, the word “Advent” means the arrival of a notable person. And this arrival was actually foretold 6,000 years ago. Genesis 3:15 is one of the most foundational verses in the Bible. In fact, it sets up the story of the entire Bible. Not only is there a promised Seed—this verse is also a declaration of war against our enemy. Not far from Eden is a place called Babylon, where the enemy built a stronghold. After a failed tower experiment (Tower of Babel), God moves the Seed away from Babylon (actually nearby Ur) to a place called Canaan—the territory containing Bethlehem. After a detour to Egypt and then a return back to Canaan, the Seed is exiled to Babylon again! That’s a problem, because the plan is to bring the Seed to Bethlehem. Many stories in the Bible depict this exciting journey of promised redemption. Since the Garden, forces of evil sought to threaten the Seed’s survival. But God always responds, sometimes with a climactic event, keeping the plan on course. Eventually, sixty-three generations after Adam, this Seed arrives—Jesus in the form of a baby. When reading the Bible we often skip the genealogies. The names are long and hard to pronounce. But what if we saw the lineage of Jesus as an epic tale of survival, as a battle, and as a victory? Over a period of roughly 4,000 years, the Seed of Adam finally appears to an expectant mother and father in a town called Bethlehem. The Seed’s journey through 4,000 years of silent nights helps us make sense of the story, and appreciate the flow of the Bible, the Old Testament minutia, and the true story of Christmas. Adults and children can realize how the manger in Bethlehem was not an isolated, feel-good Bible story, but a promise that’s been in process since the Garden of Eden. 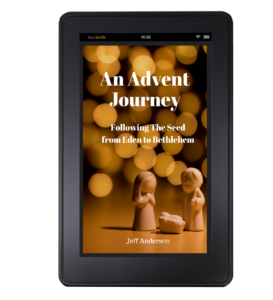 You can also read An Advent Journey on Kindle. Click here to buy on Amazon.